Rachel with her adorable CanDo Kiddo…where else? Outside! I’m assuming that most people reading this blog already know the importance of getting your children outside. For older children, it’s pretty simple – just open the door! But infants can be tricky, especially during those early weeks when baby doesn’t really “do” much. Babywearing on hikes and a blanket spread out on the back lawn are great, but did you know there are ways you can take your little adventurer’s nature experiernces even further? Today on the blog I have a special treat for everyone – guest writer Rachel Coley, MS, OTR/L, is sharing some tips for making sure even the itty-bittiest of babies can log some green hour time on the daily! My connection with Rachel is through, you guessed it – climbing! Though Rachel herself prefers to stay grounded, we’ve roped up with her hubby a handful of times. Rachel and her husband recently became first-time parents, and they both share our family’s passion for getting our kiddos outside and enjoying nature as much as possible. 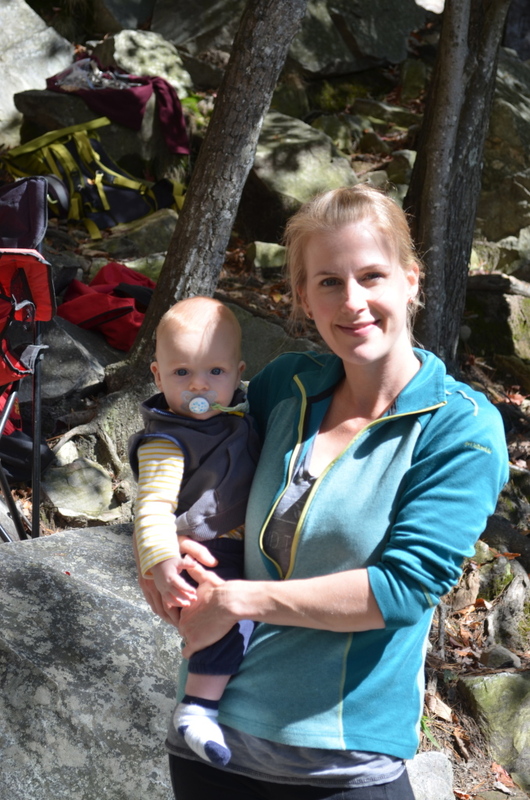 But here’s what makes her an expert on the subject of nature play and babies – Rachel has been a pediatric Occupational Therapist for 8 years and has advanced training in the areas of infant neurodevelopment, sensory processing, Plagiocephaly and Torticollis (head and neck issues of infancy). As a new mom, Rachel lets her personal passion for parenting and her professional expertise about babies collide in CanDo Kiddo, a family business with a mission to support and inspire new parents to play with their newborns for healthy development. Here are Rachel’s thoughts for incorporating nature play into your family’s daily grind during those early weeks and months. Tummy Time is important for healthy development, especially if your little one spends lots of time in her carseat on the way to her outdoor adventures. Lots of infants don’t love belly-down playtime, but I’ve found that many tolerate it much better in novel surroundings. A small patch of level ground (not rock) and a camping pad, thick blanket or coat is all you’ll need to give your little one a cozy spot for belly down play on the go. And if you have a Peapod Plus (reviewed here on Cragmama,) your baby can enjoy Tummy Time in the lap of luxury! 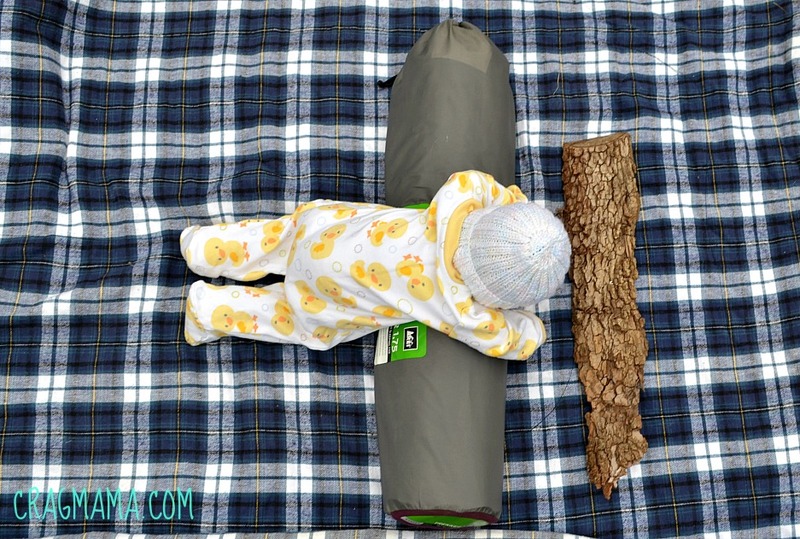 Use a camping pad, jacket or anything else in your pack that can be rolled into a small log-shape to place under baby’s chest if your baby doesn’t yet lift her head for more than a few seconds. This will give her a better view of her surroundings and increase her ability to stay in the position for a little longer. Place items from the environment out of baby’s reach to look at, or place larger objects (nothing sharp or smaller than your fist) in front of baby to touch. Have you noticed how many baby toys are now touting the label of being “sensory” toys? Usually this means that the manufacturer has added something that makes a sound, smell or has an interesting texture. But almost every object you come into contact with in nature makes a sound, smell or has an interesting texture. And as long as you are super-attentive, directly supervise to prevent mouthing and confident that it’s not poisonous or dangerous, your baby can explore pinecones, leaves, rocks, sand and so many other of nature’s best sensory toys. 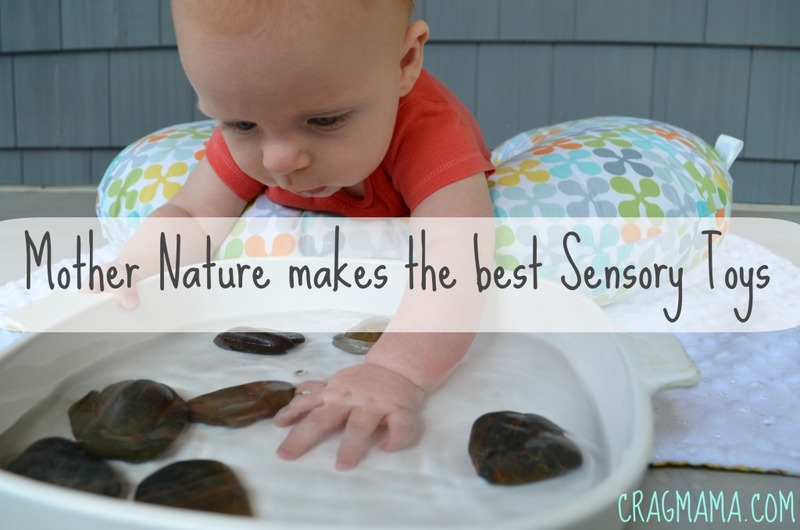 Don’t forget about sensory play for baby’s feet. If the weather allows, take your little one’s socks off for a few minutes and let her experience dirt, stones, sand, grass, the water in a cool mountain stream. Whether at home or on the trail, infants need supervision. But sometimes you have to multi-task or take your eyes off of junior for a few seconds. Clear water bottles and tupperware are a great way to display natural materials while keeping baby safe. 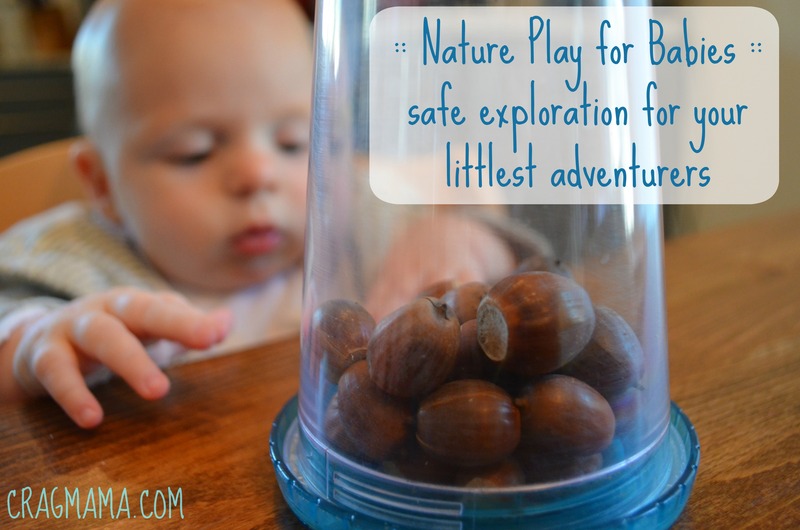 Just drop acorns, sticks, shells or pebbles in and let baby safely look, shake, and drool to her heart’s content. Life as new parents usually involves plenty of time at base camp – your home. If you’re trying to raise a nature-lover from the start, incorporate natural materials into your baby’s everyday playscape. We keep a wooden bowl by the front door to place interesting things found outside on our walk or on weekend adventures. Throughout the week, I’ll help my little guy look at and safely touch the materials as I talk about them. When we read a book that talks about leaves or rocks or rain, I point those items out on our walks and we bring them home to play. It’s also fun to incorporate seasonal items such as pumpkins in the fall, bulbs in the spring, and icicles in the winter into your baby’s play at home. 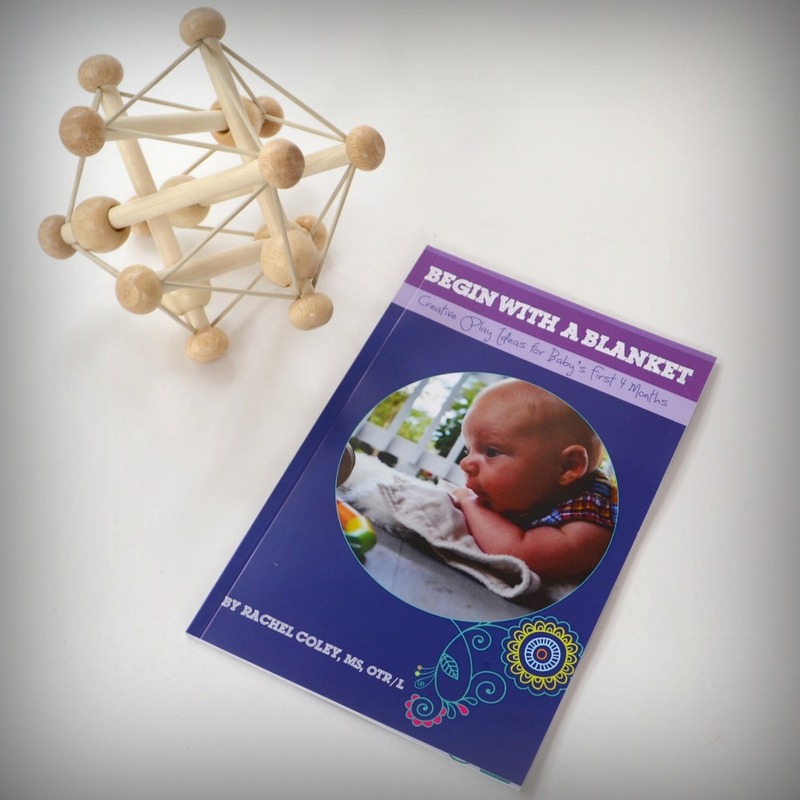 In addition to these tips, Rachel has also generously offered to giveaway a copy of her new book, Begin with a Blanket: Creative Play Ideas for Baby’s First 4 Months, to one lucky Cragmama reader! This full-color, 60 page paperback book walks you through 45 creative play activities for newborns. It also offers insight to common questions that parents might have, such as what to do if your baby HATES tummy time, how to keep your baby from developing a flat head. To enter, just fill out the Rafflecopter widget below – as usual, you can gain entries by commenting on the post, but this time you can also get additional entries by subscribing to email notifications for both Cragmama and CanDo Kiddo posts! A winner will be randomly chosen at midnight on December 16th, so best of luck! Thanks so much to Rachel for sharing her expertise! For those of you who have (or had…time flies!) babies in this stage of development, what ways do/did you encourage him or her to explore her outdoor surroundings? Oh yeah, and for specific beta about getting itty bitty babies out at the crag as soon as your family is ready, check out these posts. awesome! my boyfriend’s sister just had a baby. This is perfect timing. I’m so glad you found this post to share with her. Enjoy the new baby smell! I love this post, especially since I have a baby on the way. I feel like the more kids I have the more I will naturally let the younger ones have more freedom in the outdoors (mostly by being distracted by the older ones) but it’s great to have some concrete ideas on how to get out with a little one in tow. That’s a great point, Susan! I think with more kids, parents also relax a bit and let them get messier and more daring. But I can definitely imagine your attention gets very divided between more than one kiddo. Happy playing! I totally needed this. My 8-month-old is always wanting to do what the big kids do and with his new found crawling freedom, that means escaping out through the backdoor every time I turn around. I was having such a hard time finding natural things for him to explore (and not swallow). The tip about putting things in a clear container is genius – rocks + tupperware made for a very happy baby today. Thanks for the tips!